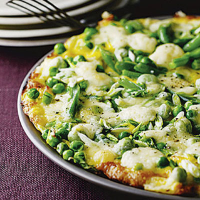 An easy vegetarian open omelette made with rich duck eggs and crumbly Caerphilly cheese. Preheat the grill to high. Beat the eggs together in a large bowl with a fork. Heat the butter, until foaming, in a large non-stick frying pan with a heatproof handle. Season the eggs just before cooking the omelette (if salt is added too early they will become runny) then pour them quickly into the hot pan. Stir with a fork and cook for 1-2 minutes, until the mixture is beginning to set but the centre is still a little runny. Scatter the salad onions, vegetables and cheese over the top in an even layer. Stir the mixture gently just once or twice to lift some of the egg to the surface in places. Remove from the heat. Grind a little black pepper over the top of the omelette and grill for 1-2 minutes, until the cheese is just melting and the omelette is barely set (see cook's tips). Serve with a ready-prepared salad, such as Waitrose Beetroot Salad, drizzled with a little extra virgin olive oil. Duck eggs are perfect for this dish because they are rich in flavour and bigger than hens’ eggs. Recipes containing raw egg are unsuitable for the young, pregnant women, elderly people or those with a weak immune system. A good-quality New World Chardonnay will work well with a mild cheese such as Caerphilly.